Negra with a blanket on her head. Foxie and Burrito eating frozen cantaloupe. The wind off the grassy, Eastern Washington hillside began to swirl as I got out of the car at the Chimpanzee Sanctuary Northwest (CSNW) in Cle Elum, Wash., in May. There was not a person or animal in sight. Naively, I expected the sound of jungle noises, like something in a Disney movie, but the place was silent. I was nervous to visit. Are the chimps as human-like as I have read? Would it be difficult to learn about their prior lives in a laboratory? But the quiescent surroundings seemed to ease my fears. “What a perfect place for chimpanzees to heal,” I thought. Diana Goodrich, director of outreach, met me at the entrance to the building. Inside, resident chimpanzees Jamie, Jody, Missy, Negra, Annie, Burrito and Foxie were eagerly waiting for a lunch of fresh tomatoes, Brussels sprouts and leaks. Located on 26 acres of private land, a cleverly constructed steel reinforced building allows the chimps a home to sleep, play, groom and otherwise live uninterrupted social lives as a cohesive group. Hammocks are draped from the two-story-high, sky-lit ceilings and swing ropes and are strategically placed to access multiple platforms. In my first glimpse of the building interior, I witnessed Missy and Annie playfully wrestling. Burrito came to the kitchen window to check on the progress of lunch, as Goodrich guided me through safety regulations that must be respected around chimpanzees. 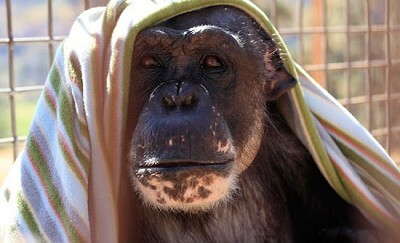 Jamie, the leader of the troupe, arrived at the sanctuary with her six companions in 2008. The seven chimps were most recently used to test hepatitis vaccines, which required invasive liver samples taken on a regular basis — a terrifying experience for the chimps. All of the chimps are in their late 20s or 30s, and their lives have been made up of several chapters of exploitation, abuse or trauma. Jamie was forced to work in the entertainment industry before she was sold to into biomedical research. Negra, the oldest chimp, was kidnapped from her parents in the wild as an infant. She lived in a research lab for roughly 35 years, often being used for “breeding” and was repeatedly traumatized by having her children taken from her shortly after birth. While their home at the sanctuary can never replace life in the wild, this serene sanctuary offers relief, peace and the first opportunity for these chimpanzees to live with the dignity that they deserve. Lunchtime starts with the enthusiastic arrival of the chimps. As good communicators, they indicate to Goodrich which vegetables they like most and want more of. Their individual personalities come out as she passes out tomato slices. Negra claps her hands when she is ready for another piece. The vegetarian lunch is finished with special biscuits. Foxie playfully crams 18 biscuits into her mouth one-by-one, as Goodrich laughs at the contest to see how many Foxie will take. Robertson worked for many years cleaning and doing laundry at the sanctuary before she trained to serve the chimpanzees their meals. In recent months, the sanctuary added Young’s Hill, a 2-acre, fenced enclosure, to give the chimps access to a natural roaming area. Building the enclosure required many volunteer work parties over the summer. One such party from the Northwest Animal Rights Network (NARN) in Seattle sank 10-foot fence posts for the project — a monumental task. NARN board president Rachel Bjork explained that her volunteers were recruited from the general public, as well as from among the fellow members of NARN. They were rewarded with the opportunity to see these wild animals up close. The sanctuary staff includes several Central Washington University graduates of the Primate Behavior and Ecology program, whose experience with chimpanzees led them to the conclusion that the use of chimpanzees in medical research, and especially in entertainment, is unnecessary and certainly unethical. But these advocates are not alone. The U.S. National Institutes of Health (NIH), a major funder of biomedical research using chimps, recently commissioned its own medical authorities to review chimp research. The NIH’s December 2011 report states that chimpanzee research is superfluous due to more advanced research models and that ethics should be considered in the decision to do chimp-involved research. As a result, the NIH placed a temporary moratorium on future invasive research involving chimps and are examining current experiments that are still ongoing. New ethical standards are being reviewed. Some 1000 chimpanzees are currently owned by the U.S. government for medical research — a number that nearly 180 U.S. Congressmen and -women hope to cut dramatically. Sen. Maria Cantwell, along with 14 co-sponsors in the Senate, introduced the Great Ape Protection and Cost Savings Act (HR1513) in Congress. The act recently received its first hearing in April 2012. The new legislation would retire 500 chimpanzees from medical research and phase out invasive research on chimpanzees by the U.S. government. The United States is only one of two countries in the world that use chimpanzees in biomedical research. “Ending invasive research will mean a savings of more than $25 million per year for the American people,” Cantwell explained in a press release. While biomedical chimp research is waning, the use of chimpanzees and other apes in entertainment is similarly unnecessary and is usually abusive. As wild animals, primates are coerced to act. CSNW formed an advocacy arm called Primate Patrol to address this issue. Members are notified via e-mail about whom to contact to protest the use of primates in television and film. Patrollers can keep an eye out for featured animals in entertainment and report their appearance to Primate Patrol for follow-up. 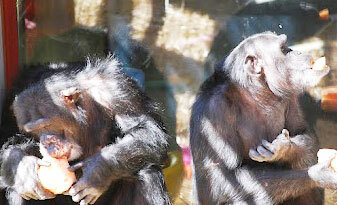 After my brief visit with the CSNW chimpanzees, I have become addicted to the organization’s blog. The site is updated with stunning pictures of the chimps living their lives on their own with a little help from sanctuary staff to provide enrichment. Foxie is attached to dolls. Jamie is fascinated by shoes and boots. Negra and Jody love blankets. Annie and Missy are the best of friends who love to play, and Burrito, the only male, loves human interaction and loves to eat. Being around chimpanzees seems to make you ask all the right questions about the ethical treatment of animals and what it means to us as we share the world with them. For more information CSNW, visit its website at chimpsnw.org. For a local connection to animal welfare, visit the NARN website at www.narn.org. CHRISTIE LAGALLY writes a blog called “Sniffing Out Home: A Search for Animal Welfare Solutions” at www.sniffingouthome.org.